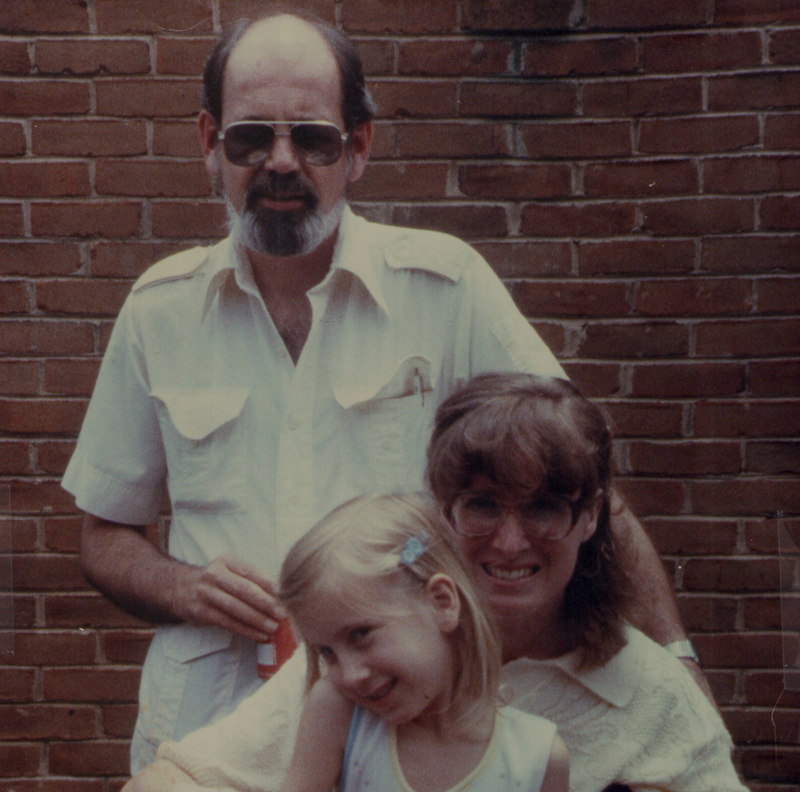 The author with her parents, Skip and Denise, 1985. Worry about your children’s welfare. Worry about your family and friends. Worry about not wasting your life. Worry about kindness and love. Don’t worry about conversations you had yesterday. Don’t worry about what other people think of you. Don’t worry about what other people think, period. Don’t worry about jogging strollers. Don’t worry about jumperoos vs. exersaucers. Don’t worry about getting a fancy anything unless you really want it. When holding a newborn, don’t worry that he is so tiny and fragile you might break him just by holding him. If babies were that fragile, we wouldn’t have a human race. If you had great parents, don’t worry about living up to impossible expectations of what parenting should be like. Your parents surely, surely had days when they made mistakes, maybe even huge ones. If your parents were awful, don’t worry about doing everything differently to create some magical world full of goodness and light for your own child. Just do your best. There will probably be plenty of magic and goodness and light. Absolutely don’t cry yourself to sleep thinking you are the world’s worst mother. You’re probably doing better than you think. In fact I bet you are strong and beautiful. I feel certain that you deserve happiness and love. Don’t worry about the dark circles under your eyes from lack of sleep and lack of makeup and just being plain tired and wrung out every day. Don’t worry about the fact that Mom X gives her kids all organic food when you don’t. Don’t worry about what Mom X must think when you pull out a bag of Honey-Nut Cheerios and food-dye-ridden Goldfish crackers for your toddler, while she feeds her kid homemade flaxseed bread and homemade yogurt with a smattering of wheat germ. Don’t worry about anything anyone posts on Facebook. Ever. Don’t worry about haters in general. If you had your heart set on nursing, don’t worry if you can’t. And don’t you dare let any parent bottle-shame you. When you are sitting at the park with your baby in your lap, and you pull that bottle of formula out of your bag – hold your head high because you are feeding your baby. If your own parents are gone like mine are, don’t worry that your kid will grow up never knowing them. They’re around – somewhere. They’re inside of you. They’re inside of your kid. They’re in photo albums and in the books they read to you, the ones you now read to him. Don’t worry about how you will eventually have to explain what death is, and where Granny Denise and Grampa Skip are. When your kid starts to point out “Nise” and “Skip” in the family photos on the wall, because you’ve been doing that, don’t worry if you cry in front of him. When he says, “Mama sad” – don’t worry about what to say. Something will come. And then he’ll probably want to hug you, and it will be the best hug in the world. Ever. And then you can say, “Mama happy,” and mean it. Don’t worry about being the perfect mother. Don’t worry about perfection, period. It doesn’t exist, and if it did, life would be a hell of a lot less interesting. How can I be a mother and still be a human being in my own right? If I’m not happy, how can I get there? If I’m not happy with how I fit into my world, how can I fix that? Am I doing my best, as a parent, as a human being, in general, etc.? What tangible, specific things can I do to make my life better, or others’ lives better, and maybe even make my world a better place to live? If I want to make my mark on the world, how can I do that? 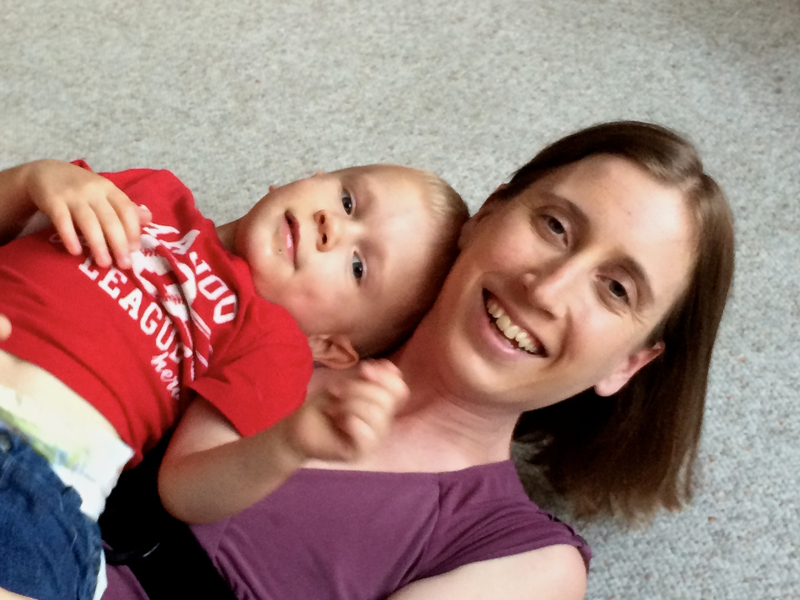 The author with her son, 2015. Norah Vawter wishes time travel were possible so she could party with Scott Fitzgerald and then talk literature. She earned an MFA in fiction from George Mason University and has work published or forthcoming in Extract(s), The Nassau Review, and Agave. Currently she stays at home with her toddler while at work on her first novel. This entry was posted in Identity, Literature and tagged birth, Childhood, death, F. Scott Fitzgerald, grief, loss, Mother's Day, motherhood, Norah Vawter, Open Letter, Parenthood, parenting, Things to Worry About. Bookmark the permalink.